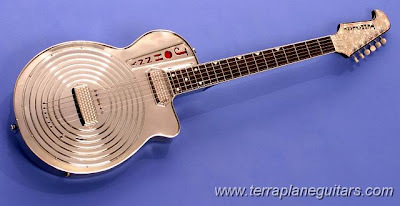 One special axe: Johnny Winter would like to extend his heartfelt thanks to Mark Simon and the Terraplane Resonator Guitar Company for the spectacular custom-made guitar that Mark presented to Johnny on Jan. 23 at B.B. King's in Times Square. The Terraplane Johnny Winter Zydeco Custom is truly a sight to behold, and you've gotta see it to believe it. The new guitar is featured in the March issue of 20th Century Guitar. You can see additional photos and learn more about the guitar and how Mark builds them on his Web site. Mark is based in Bridgewater, New Jersey, and has been restoring guitars for 35 years. In addition to the Terraplane link above, you can learn more about Mark at marksimonguitars.com. Thanks again for your amazing work, Mark.